An area rug can add a huge impact to the look of our spaces especially in the living room. It can help define the space as well as add more beauty to it. Area rugs, as we all know, come in different colors, sizes, shapes and materials. In choosing one, you have to consider your household and how you use the area. We have shared some tips about this before and I know it would be very helpful for you. 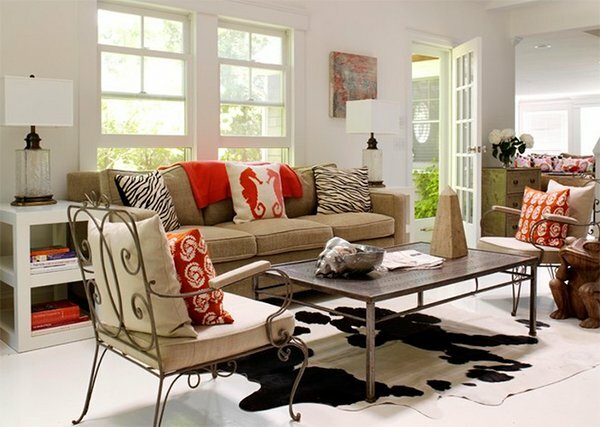 Since there are many types of area rugs, let us focus on one which is the cowhide area rug. A cowhide rug is made from the natural unbleached skin and hair of a cow. It brings in a natural feel to the home, may be it in the bedroom, living room or dining room. Commonly, it comes in a unique form but there are also some that are rectangular in shape. 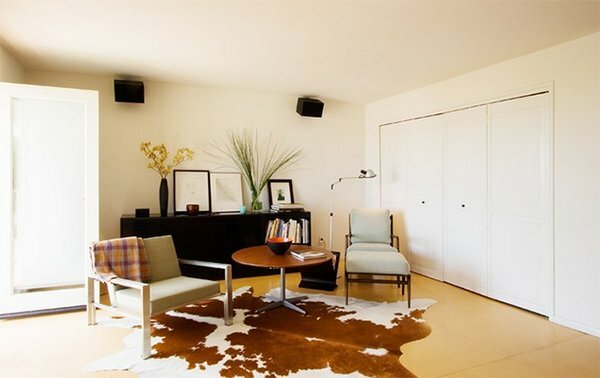 Today, I have gathered some living rooms with cowhide rugs in them. Let us see how the designers used it in the different interiors. Who wouldn’t not notice that mirror sunburst on the mantle? 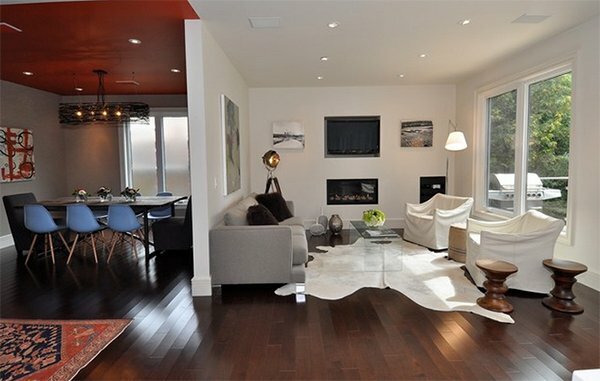 I know you saw it first but let us take a look at the cowhide that completed the look of this living area. 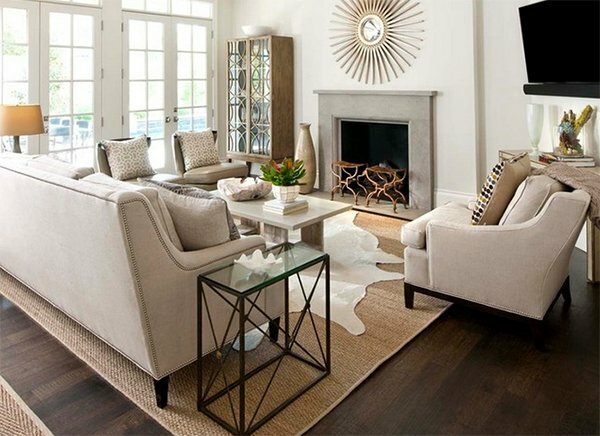 A cowhide rug perfectly fits a living room with browns and grays. 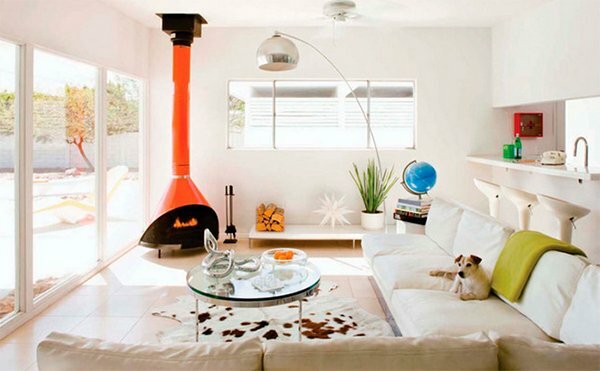 A white cowhide looks pretty neat especially if you want to retain a certain clean feel to your space. This one has browns and whites on it but what made this living area charming are the ottomans as well as the pillows. 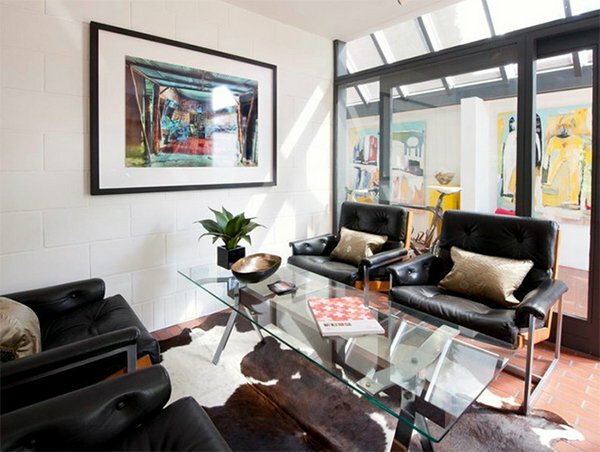 Squares comprise this cowhide which seems to go with the modern look that the owner wanted to achieve. 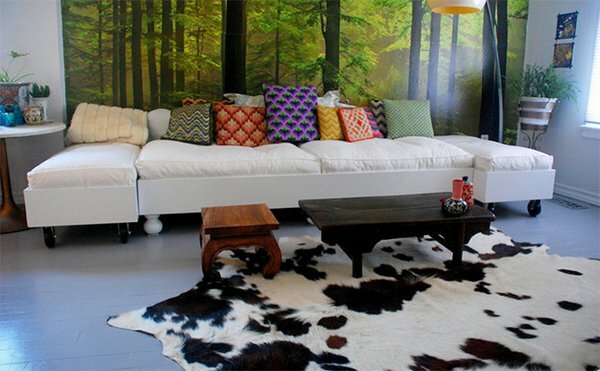 Even with a wallpapered living space, a cowhide will still work well. Just don’t use printed furniture so it won’t look crowded. 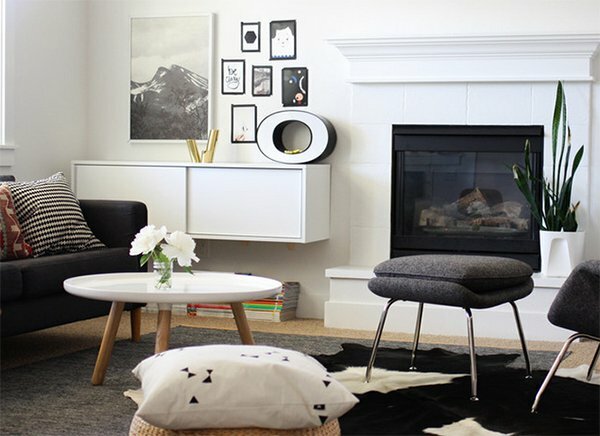 I’d say this one has a subtle Scandinavian feel with pops of color from the throw pillows. 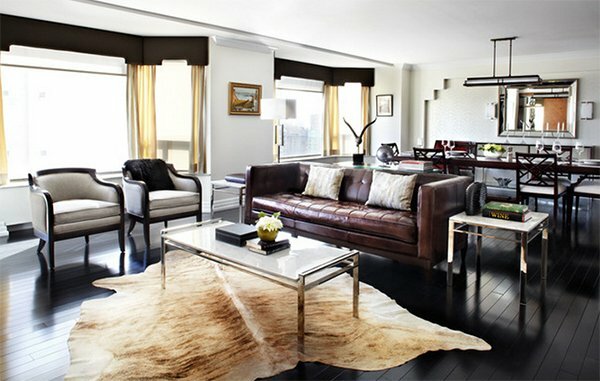 A black cowhide defined this area while a sheepskin adds some softness to the aura. 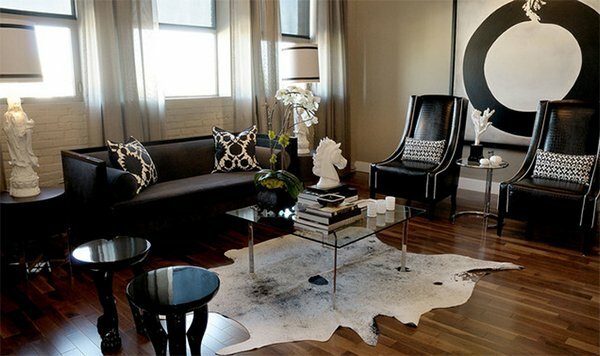 Another way of using a cowhide is to put it on top of an area rug. 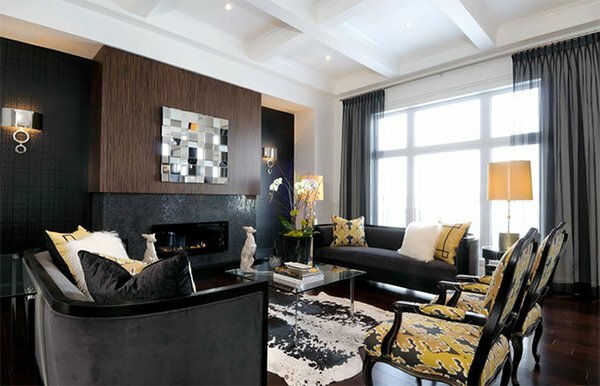 Plains and patterns work well if you do not overdo it just like this living area in brown, black, gray and yellow. 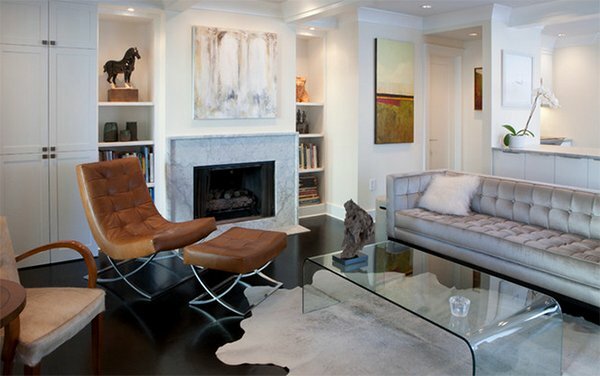 A gray cowhide with a distinct form graced this living area that has an eclectic mix of furniture. 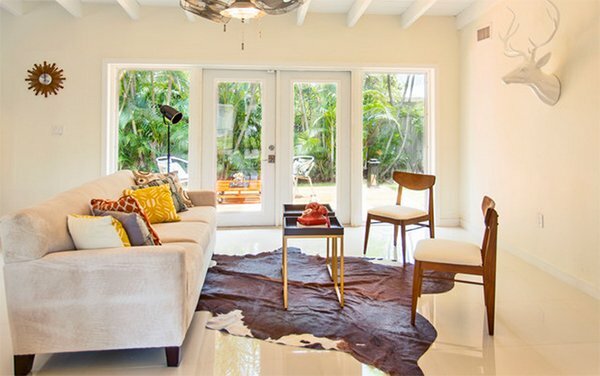 If you put lesser furniture, adding a cowhide can add more life to your home. You can still feel the cow hair of this run and I’d prefer something like this one. 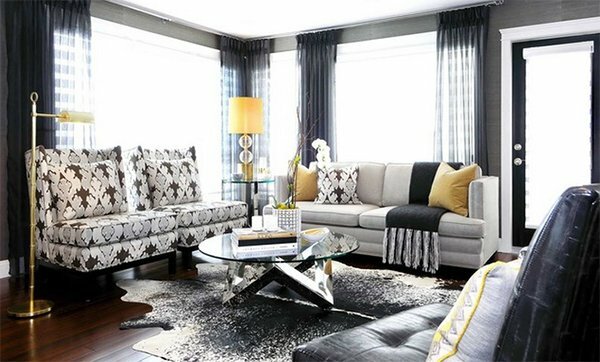 A living area with orange, brown and different patterns looked more beautiful with this black and white cowhide. 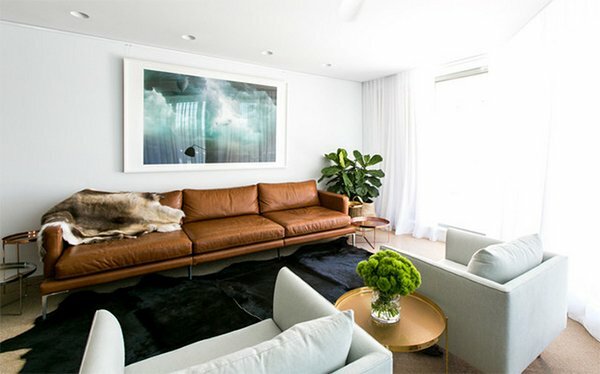 A Scandinavian living space doesn’t look over decorated with a cowhide in this print. Or you can also go for something with more prints on it like this one. This space looks masculine. 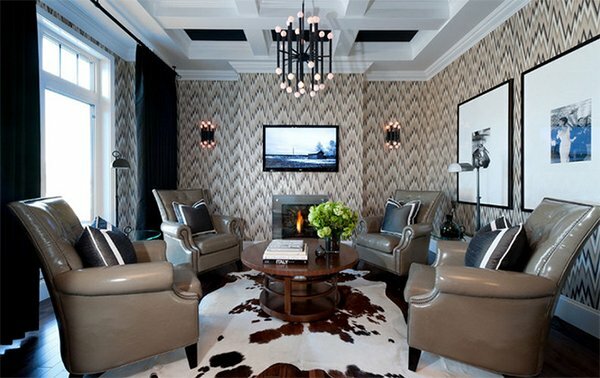 Black and white cowhide graces this sophisticated living area with glass elements and a beautiful fireplace. This also added the cowhide on top of the rectangular area rug. I actually think it is a better idea. A small living space can still look fab with a rug like this! 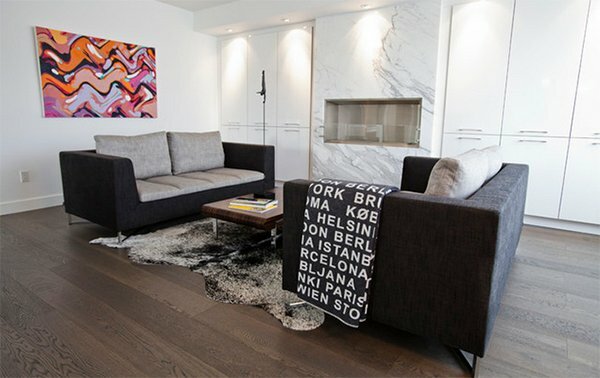 This one has unique form and is just fitting in this living area with black furniture. 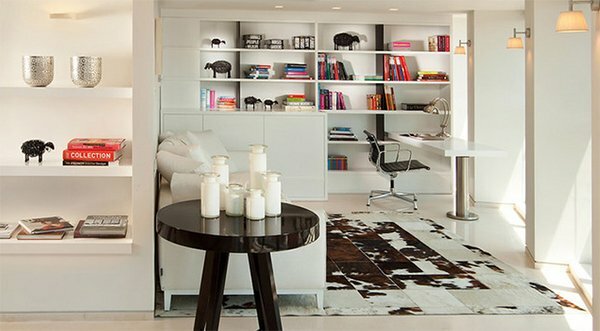 Now that you have seen the living rooms, you now have an idea of how you can arrange your space with a cowhide. You have seen also the palette that works well with the rug and its impact to the entire look of the space. I actually like the organic feel it adds to the space. It looks soft too and could bring that feel to the interior. How about you, what type of area rug do you prefer to use and for what reason?